As facelifts go, the newly updated A6 sedan and A7 Sportback – together with the hotter S-branded variants – need endure no mid-life crisis. Stylish, well built, suitably prestigious and well-appointed, there really wasn’t much to ‘fix’. The 2015 versions are therefore more massaged than made over, focusing on sharpening the design to maintain visual freshness, along with a few selective fiddles in the vast VAG powertrain parts-bin, and some nifty in-cabin tech to remain relevant. The sharper nose and tail, particularly the slimmer light design, work beautifully with either body style. Fancy Matrix LED headlights, and ‘strobing’ indicators at both ends, are now handsome cost options. 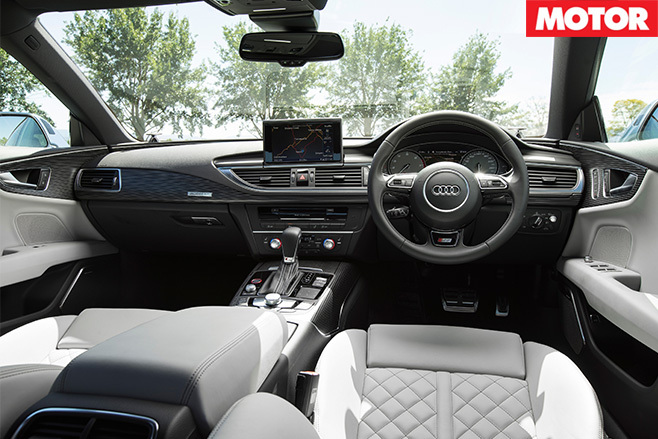 New-gen infotainment anchors are the obvious interior update, and while it takes trainspotting to notice subtle tweaks to cabin styling, the outgoing A6 breed was a high watermark of presentation and slickness to begin with, so nothing required fixing. Between the axles, the only significant A6/A7 hardware change is a new 1.8-litre turbo-four and seven-speed twin-clutch gearbox replacing the old 2.0TFSI and multitronic CVT combo. Closer to MOTOR’s fast lane, though, are the S variants. The 4.0-litre biturbo V8 has had a tickle, jumping to 331kW from an outgoing 309kW. It makes peak power slightly higher too (now 5800-6400rpm), though torque remains at a still-heady 550Nm from just 1400rpm. Quick? You bet. Audi’s claim is a ferociously brisk 4.4sec for S6, 4.6sec for S7, and they certainly feels that potent from the seat of the pants. If Ingolstadt’s track record is any measure, the quattro-driven luxo-rockets will nail their claims without fuss, even on less-than-perfect surfaces. That, then, is the real appeal. Both sit on 20s, feature adaptable air suspension and adopt luxo q-car manners in Comfort mode. The experience is more polite, mature, livable, super-refined daily driver than the harder-core experience of RS equivalents. But I’d wager an S6 would have the accelerative measure of an M5 or E63 S more often than not. And from $169,900 for the S6, it’s more affordable, too. Where abilities feel slightly wanting, though, is in the corners. With tricky quattro sport rear differentials, a ‘base’ 40-front 60-rear torque split and fat 265mm-wide rubber, both muster up serious cornering grip, tempered with reasonable adjustability and poise. But at 1970kg (or 2030kg in S7), there comes a point where mass overwhelms any dynamic talent. That’s no slight, though. 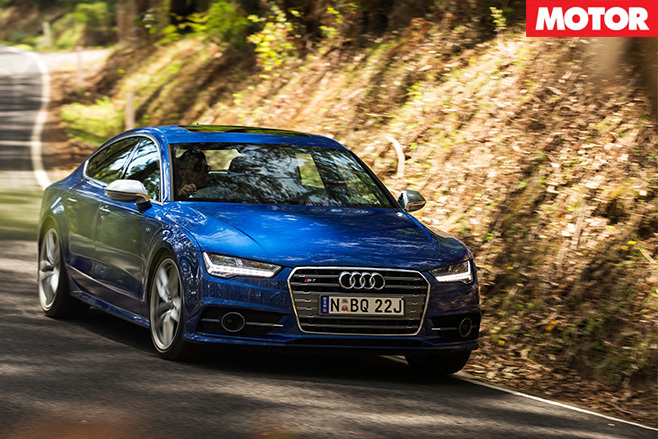 Audi does the RS thing, for a handsome premium, if agility and outright ferocity is your bag. The S6 and S7 instead occupy a space between luxo-touring and the kind of A-to-B back road pace many owners won’t come close to fully exploring.